Where did it all start? What would induce two ordinarily busy people to sit down one evening and seriously discuss the possibility of setting up a wine business? Neither had endless tracts of unused time and neither were looking to it for a significant additional income stream. Indeed, advice received from those long experienced in the trade indicated that the latter was unlikely. 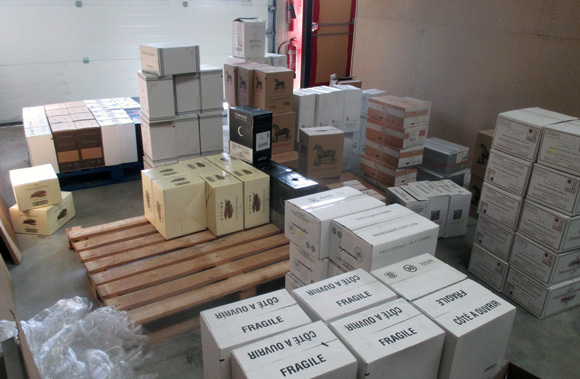 The arguable health benefits of shifting several metric tonnes of wine and packaging several times over - by strict adherence to the company's manual handling policy, of course - did not weigh significantly in the early deliberations either. Importantly, both shared a long held fascination with the vast diversity of style and flavour of a product which in simple terms is just fermented grape juice. Both had already enjoyed many happy times truffling out enchanting examples from a landscape of bulk acceptability and both had recently followed their interest into completing the Wine and Spirit Education Trust's advanced certificate. The conversation that late spring centred perhaps unexpectedly, around people. People tending vines on land theirs for generations. People seeking with each new vintage to maximise the wine potential from both grape and place. People with only thirty to forty chances to do their best work thanks to the annual production cycle. Then on the other hand, people who shared an interest in reaping the reward of drinking wine made in this way. People frustrated by the hit and miss nature of purchasing wine in this country. People yet to experience the quality and diversity on offer. As these thoughts were expressed, the linking of these two groups emerged as a clear central principle of any possible wine merchant business. Louis Pasteur, the founding father of modern microbiology is often misquoted in the wine trade. Accurate quotation attributes that; after water, wine is the healthiest of drinks. Whether he simply enjoyed wine or had in mind the anti-microbial effect of alcohol is unclear. Wine is about 85% water and 13% alcohol leaving about 2% of the content responsible for the whole gamut of possibilities in wine making. This becomes a little less surprising when you consider the almost infinitesimally small quantity of cork taint that can destroy the lot. Two percent of the content is what the dedicated vine grower and wine maker is carefully nurturing into his or her final product. A moment's reflection on the number of words associated with wine; colours, aromas, flavours and overall impressions, supplemented if you like with an internet search, reinforces the impact of the two percent. Now add in the requirements of the vine plant, the unpredictability of the temperate climate, moulds and fungi and hungry creatures ranging from parrots and kangaroos to root destroying phylloxera and you find yourself wondering how we have any decent wine to drink at all. Experience and knowhow handed down from winemaking parent to winemaking child, supplemented these days with higher education and international experience is part of the story. Add to this passion for their vocation, curiosity and a continuous desire to improve and you begin to see the sort of producer whose wine you would be keen to drink. As consumers we have more of an influence than at first we might imagine. We can choose to support the familiar, readily available bulk production. This has all the benefits of the safe choice and avoids disappointment which we all dislike. But then again, we could choose to ask who it is that is making the wine we drink and why are they making it? Finding the answers to these questions takes time and effort. But, if as consumers we don't apply some of this discretion, we risk driving out of business the very people whose wine we would love to try. This would be a shame, especially if it only happened because we were unaware of the impact of our choices. Globally, wine is big business. Approximately 18 billion bottles each year. Scattered through this ocean are islands of information available to the curious and adventurous wine consumer. Making such information more readily available to a similarly curious audience is one of the pleasures of the enthusiastic wine merchant. As that late spring evening conversation drew to a close, it became clear that the question was not so much about why they would start a wine business. Much rather, given the enormous pleasures of really good wine flowing from the dedication of committed producers, why would they not?